I was recently digging through an archive of old 3dfx files that were sent to me more than a decade ago. I don’t even recall who sent them anymore, but there was a treasure trove of internal documentation from within the walls of 3dfx Interactive, Inc. Among them included planning documents to take advantage of new features in the then upcoming DirectX 8 APIs, an audit-list of who has which test Voodoo 5 5500 card, benchmark results from hours of testing, lists of software used for testing, and much, much more. 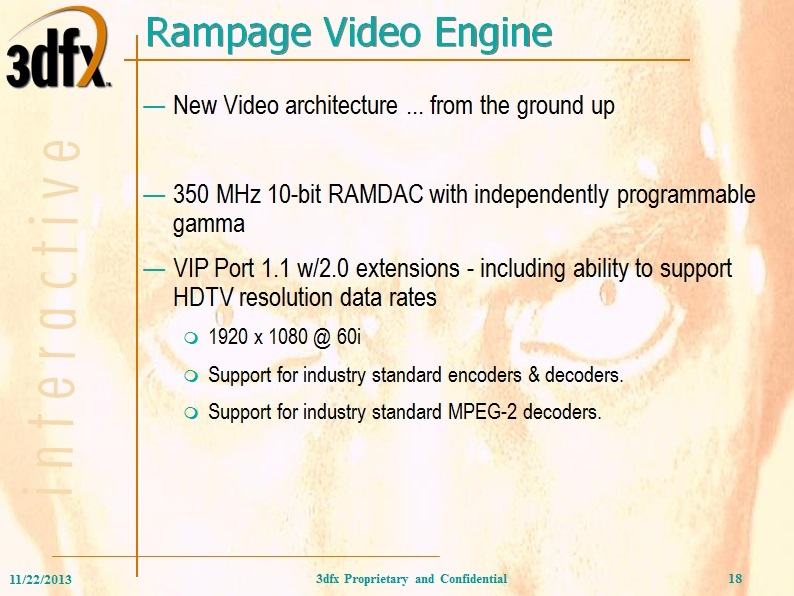 What I found most fascinating was a file named Rampage_Q3D_083199.ppt. This PowerPoint I had long since forgotten was a presentation used to introduce the upcoming Rampage card to developers (and the date in the file name just so happens to have been my fifteenth birthday – so I clearly wasn’t the one writing this!). If they wanted to corner the market, they had to start early. This document was produced a full 16 months before the closing of 3dfx, and represented a much more optimistic time, when attitudes were positive and 3dfx looked like they could do anything. 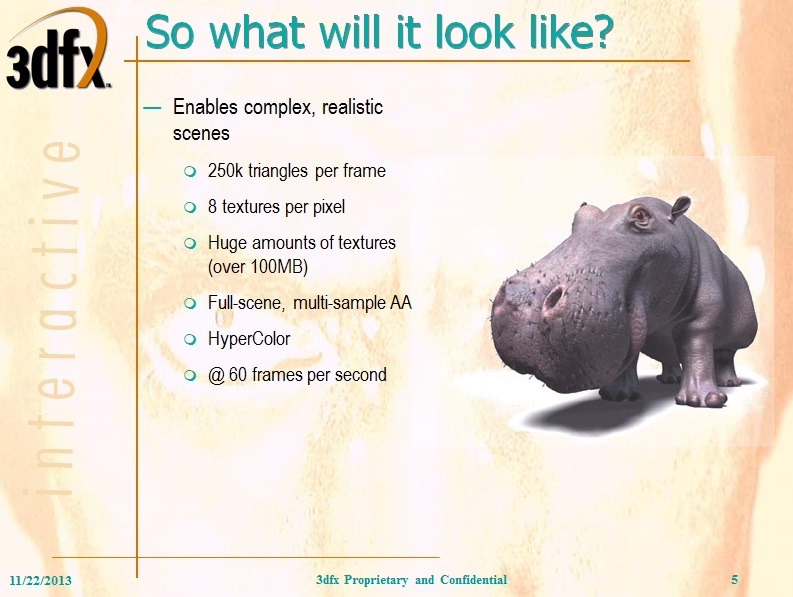 The PowerPoint links to some demo videos which are no longer available, what a treat it would’ve been to see those, but it is still fun to see them promising games in 60 frames per second, and full support for MPEG-2 decompression at 1080i resolution! It’s fun to see what might have been, and a little disheartening when you see the extremely short time table that had originally laid out for themselves. We almost had these cards, but alas, only a tiny handful of prototype boards will ever exist. I won’t pull a Snowden on you and tease you for months. You can download the full PowerPoint file, Rampage_Q3D_083199.ppt, right now, and remember the times when Glide was king, and Unreal Tournament and Quake 3 Arena consumed your life.